There is a dreadful temptation to treat a text as though it were some sort of puzzle box. Execute the correct series of moves and the object springs open neatly, revealing all its secrets. We are taught to do this at school (or at any rate, I was), and while at university we may be told there is no right or wrong way to approach a text, and that each interpretation is equally valid, some interpretations still seem to be more valid than others. That is, some interpretations receive more support than others, and are more likely to be written about, thus privileging a certain reading of the text over others. When disagreement does arise, it’s more usually a matter of engaging with the reading rather than the text itself. Recently, I’ve been reading Jennifer Marie Brissett’s Elysium (Aqueduct, 2014), and I was struck by how it both invites and rejects the puzzle-solving approach to literary commentary. Invites, because the structure of this novel is apparently composed of many thin layers of story that on occasion seem to fuse together, encouraging a careful unwrapping and peeling apart to get at the heart of story. Rejects, because, as the story does unfold, one realises that ‘unfolds’ is in fact a very poor description of what is happening here. Brissett does seem to provide hints as to how one might approach the text, though they aren’t as helpful as they might initially seem. Which is hardly surprising – why would an author want to give away everything at the beginning? Maybe because it’s fun to hide something in plain view and wait for people to notice? Or not notice. 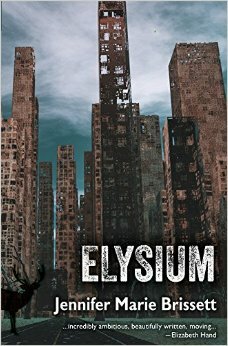 But while I am interested in the way readers approach science fiction and fantasy novels, and the expectations they bring to such a text, I am also interested in the ways in which authors indirectly comment on readers’ expectation, and it feels to me that some extent at least, Brissett does this with Elysium. Have I ever mentioned how much I dislike computer gobbledygook in a narrative? I suspect I dislike it because I have read so many (mainly unpublished) novels in which the use of ‘programming language’ is a marker of ‘science fiction’. Or, indeed, ‘near-future thriller’, because the two are pretty similar, aren’t they? (We will move rapidly past the would-be author who numbered their chapters in binary.) My tolerance of this kind of thing is very, very low, especially when too often the ideas being conveyed in the ‘language’ pass me by entirely. I’m a user, not a programmer. You may therefore imagine my joy at seeing the opening page of Elysium. I could feel whole areas of my brain closing down immediately, because, yes, like everyone else I have my dislikes and my prejudices, and this is one of them. It took me a long time to get through Gwyneth Jones’ Escape Plans, for that very reason. This is how Elysium begins. What is doing this? A drone seems reasonable, given we’re already being programmed to think about computers. A flavour of The Truman Show, perhaps. But ‘landing on the edge of a rooftop’ sounds more like a bird. Unless they’ve got some unusually cool gadgetry in this fictional world, which might be the case. Either way, I can’t help noticing that it is as though we’re pulling the focus on this possibly non-existent camera, zooming in closer and closer to the street, until we meet Adrianne, in a busy city, on her way to meet a friend for lunch. It’s a human moment: she’s been looking forward to this lunch all week. We forget about the techno-window dressing. This feels … real. Also, unreal. At least, if you think science fiction is all about the techno-window dressing, as many people do. We might, if we expect our sf to look like that, be asking ‘what’s with the woman doing nothing? For that matter, what’s with the elk? And the owl? But especially the elk, because that comes first. How do we respond to the presence of this elk? Is it real? Is it a figment of Adrianne’s imagination. Evidence of a psychosis we’ve not yet seen evidence of? At this stage it’s difficult to know what to make of it. Being the reader I am, I tend to regard its appearance as evidence of some sort of fantastical or mythic intrusion into the world, aimed at Adrianne, so I am happy to see it as being both real and unreal simultaneously. This is a view I am going to have to revise extensively as the novel unfolds. I also have one slight problem with the elk. It reminds me terribly of the Glenfiddich stag advert, though in that instance while the stag seems to be perceived by everyone, the key to the advert’s working is that that its uncertain presence is acknowledged and thus legitimised by the Morgan Freeman lookalike, presumably because he’s cool, drinks Glenfiddich and can thus accept incredible things when they walk down his street. Returning to Elysium, what I’d like to suggest here is that this opening sequence is maybe asking us something similar. How much of this can we accept simultaneously? It teases – is it sf? is it fantasy? is it a realist novel in disguise? But it is also, though we don’t yet realise it, asking us another question. Possibly two. The first is, why can’t we have all these things in the one novel? And a second: why should it matter if they are all in there together? That idea of “echoes” is attractive. It reminds me of the fact that even now the universe reverberates with the faint echoes of the Big Bang, still perfusing our surroundings even millions of years after the event occurred. And I ask myself if something similar, on a shorter timescale obviously, is going on here, given that it seems to me that the further through the novel we move, the more overtly “science fictional”it becomes. It is as though Brissett is tracking the echo, or maybe it’s a ripple, to the source, or the centre, meaning that we’re (perhaps accidentally) taking a tour of the ways in which science fiction has transformed itself. Of course, delightful as this image might be, it also has its problems, not least among them being that Elysium may be represented as arguing for a return to good old-fashioned ‘genre’ sf, when I see it as doing precisely the opposite. Were I to return to that ‘peeling away the layers’ analogy I discarded back at the beginning, I might want to say that a novel like Elysium ‘proves’ that at its heart science fiction has to have those big ideas to be proper sf: things like aliens, generation starships, underground cities, collapsing civilisations, all that sort of thing. And possibly it does. If that is true, and I’m not saying that it isn’t, not least because lately, I’ve begun to wonder if I really know what constitutes an sf novel any more, then I’d like to suggest that one of the things that Elysium as sf novel does is to avoid beginning by foregrounding the BIG ideas that allegedly define sf. Instead, we have this staggeringly ordinary scene, of a woman killing time in a street market, which could be anywhere. Only the tiny detail of the smell of ‘urine from the gutters’ suggests that we might not be in London, or anywhere else where public urination in the open is still mostly frowned upon. An overlooked alleyway, maybe, but here? This is sensory overload, for Adrianne, it seems, and for me as the reader. Heat and cold, sun and shade, a perfume that “was a mixture of sea breezes and powder” (loc.75). Reading becomes an intense experience, but is that because I’m familiar with many of these smells already? I mention this because the walk through the market, the listing of sights and sounds and smells, seems so often to be a marker in novels for the busy, the bustling, the exotic even, but when I read, the words remain on the page, nudging me about what I’m supposed to experience but rarely evoking it. Here, though … it is that line about sea breezes and powder that does it, for some reason. And here is a question. What would I have made of that dot if Elysium had not begun with a piece of computer code? Would I have thought immediately, as I did, of a computer monitor that no longer worked, or a graphics card that was beginning to fail? Which would in turn make me wonder if this street market was quite what it appeared to be. And as for that elk … But again, only Adrianne saw the green dot, so perhaps it is all in her head. The *** SYSTEM FAILURE *** almost comes as no surprise. Maybe it is meant not to be. But what strikes me too by this point is that the computer language actually makes sense. Rather than just letting my eye slide past it as I normally would, the words are actually conveying something. Bridge. Crash. Delete. Cannot Open. Error. Especially Error. Only Bridge might seem contextually difficult, but if coupled with Connect, and Restarted, it reminds me of the ftp program I use to transmit large files to one of my clients, constantly connecting, closing and connecting…And this, it will turn out, is significant. In a long review at Strange Horizons, Niall Harrison says … actually, at this point I realised to my horror that I had evidently previously read and absorbed Niall Harrison’s review, and those ripples and echoes I thought were of my own devising weren’t. Or, if I’m being kind to myself, we were evidently thinking along the same lines. Sort of. Like me, Harrison was wondering where the novel was headed, speculating as to whether we were in a revision of Joanna Russ’s The Female Man (1975), with versions of the same identity in different worlds. I wondered about that, except that at some point I noticed that phrases kept being repeated. “released into sorrow” was the first to catch my attention, because it was a little unusual, but later whole paragraphs, sections and characters began to resurface. I have been rereading Beowulf recently (the Seamus Heaney translation is very good), and thinking again about how orature is often structured around images, ideas, rote-learned passages, that can be recited at suitable points, and indeed how the story itself is structured in certain ways to trigger that recitation – for example, in Beowulf, the arrival at Hrothgar’s hall is very ceremonial, in part because that’s presumably what you do, but I’m sure in part because it facilitates the recitation of genealogies, the giving of gifts, the praise songs and so on. Which raises another question: how much of this in Elysium is story and how much plot. It’s a fine distinction in this novel, I admit, but is this about the author manipulating the reader, or is there another layer of ‘reading’ in here – that fleeting observer Harrison spots at the beginning but whom I hadn’t paid any attention to? Is it accidental artefact – created by the malfunctioning computer program, or that ftp program that can’t quite mesh with the computer memorial? Is, then, the observer actually receiving the story that Adrian, the computer whizz, wanted to tell? We come to the core story a long way into the novel. By the time we reach this Adrian, we’ve passed through many stories, or versions of stories, of people called Adrianne, Adrian, Antoine, Antoinette, Helen, Hector, and many combinations of relationship and friendship. Some stories are intensely domestic – like Adrianne’s at the beginning, with only that green dot, displaced animals and an inexplicable time shift, to suggest the science fictional element. My kind of science fiction, I might say, given I’m currently much more interested in sf in which the Incident is tucked in the background, to an extent at least. Things have happened before the novel begins, and Antoine and dying Adrian, Adrianne frustrated by the living Helen to mourn the dead Antoinette, are living in worlds somehow changed. I might be reading for those changes – the games in which animals are set loose on one another – but at the same time I also enjoy the portrayal of the here and now of daily science-fictional life, rather than the heavy-handed emphasis on survival in the ruins. There is that as well, of course. As we slip past the domestic, and past the muddled history in which the Roman Empire comes to the USA, and Adrianne becomes a Vestal Virgin, we reach two new threads of narrative: a post-apocalyptic world and the rescue from the hospital, the two braided and rebraided as different characters come to the fore. Stories are fast becoming tropes – after everything goes wrong, Antoine rescues Adrian from the hospital, and Hector comes too. They hole up in a supermarket, as you do – but wait, when did Antoine and Adrian suddenly become so much younger? They take shelter in the subways until Antoine, now Adrian’s father, vanishes, leaving Adrian, now the artist, to paint memorials all over the town. All of this seems oddly familiar, not merely in the context of the novel. Similarly, Adrianne, holed up on the upper floors of a high-rise, waits for her father to come home. He has flown away to find food. She knows now that her wings are growing in, and she is afraid, not least of her father’s reaction. Assuming he comes home, which is by no means a certainty. Have you ever wondered what happens when you put down insect powder? Do the ants or the cockroaches die tidily? Or do they change, mutate, transform horribly into something else, at a microscopic level? Even this is familiar in some respects. Aliens come to Earth, find it inhabited, dust the place with something out of a galaxy-sized container to get rid of the vermin problem. Which is us. Humanity. Later, ‘they’, the aliens, will try to tell us it was because we attacked rather than talking, while ‘we’ will point out we thought ‘they’ were attacking us to begin with. Communication failed before it began. If there is a difference here from the usual scenario, it is that the white-skinned people are the ones who experience the appalling transformations while the brown- and black-skinned peoples of the world are the ones who remain unchanged, the ones who begin to devise solutions. The ones who refuse the refugees who want to join them when they begin to create safe spaces. Going underground. Building underground. Building cities underground. Deciding to leave Earth. Generation starships. As Harrison notes, when we reach this point, the story stabilises as Engineer Adrian builds his city. Engineer Adrian is also the basis for the memorial that is inscribed in the atmosphere, when everyone finally departs, and it is that point I shall come back to in a moment. Every knowingly SFnal novel written today must confront or refuse or transform the tropes and patterns laid down over decades, must do something with them; the alternative is to ignore history at the risk of being stillborn in the megatext. Elysium takes such engagement to the next level. It is a knowing SF novel that encodes within itself not just a history of the genre, but the process of examining and revising that history through extraordinary, joyous transformation. Engineer Adrian is the stone dropped down the well, and the first half of Elysium is the ripples from his impact and at the same time he is himself the echo of the fall of a much older stone, a tale told over again in hundreds of novels and thousands of stories and in reality. I have no quarrel with that, insofar as I had come to much the same conclusion (and I would still like to believe, independently). However, here’s my problem, and I think it is a problem. What might have happened if it had been Engineer Adrianne who was scanned? Because insofar as we agree we are recapitulating a history of science fiction in this story, what doesn’t seem to me to be acknowledged as yet in commentary is that everything we’ve experienced along the way emerges from the mind of a man, a man of colour, yes, but a man nonetheless, and a man possibly with a flair for the melodramatic. Because, what we are fighting our way through is surely not a dispassionate historical account, however much we might want to see it as that. At the heart of this, we are dealing with one man’s experience, and possibly one man’s hubris. In which case we might want to stop at this point and wonder whether Engineer Adrian hasn’t bigged himself up just a little in his own memory. And whether his perspective isn’t just a little skewed when it comes to recounting certain events. It would account, for example, for the excessive romanticism of the account of the loss of his wife, Antoinette. For that matter, it may go some way to dealing with the otherwise clumsily handled death of Helen, the trans woman nobly sacrificing herself for the sake of Adrian and his brother – if we assume that this is being interpreted to us through the lens of Adrian’s misunderstanding. Having said that, I don’t disagree with the comments made by practically everyone about both sets of events but I do wonder why, when almost everything else about this novel is so admirably dealt with, those two aspects of the story do seem so clunky by comparison. One might suggest that the type of science fiction we are dealing with at this point in the historical tour is inevitably going to lead to these kinds of ill-judged scenes as emotionally stunted men try to write about their emotions, and attempt to second-guess what is going on in the heads of those around them, and that there is no alternative. And that may be so … Except that a ‘but’ hovers, like that green dot which is not a malfunction, I belatedly perceive, but a marker, the way in and out of what we finally learn are projections, immersive environments. And having criticised the fact that the ‘story’ is a man’s story, here is the mitigation. Perhaps it is not just Adrian’s story that is memorialised. He was the prototype, yes, and not by his own choice (though what would have happened if he’d said no, nominated someone else), but perhaps everyone else’s story has also been preserved as well. The final portion of the novel is given over to Adrianne – by this time we must have noticed that it is almost always a version of Adrianne who seems to have a sense that there might be something beyond the direct experience (though we also see Adrian moving in and out of the virtual environment on occasion) – the last of the actual survivors, who emerges into a world now populated by the aliens, the krestges, to update the memorial in the atmosphere one last time, an Eve of a sort, if you like. Er … is that really a mitigation? I’m not sure. We might try for ‘And it was all a dream’ … except, of course, it isn’t. And perhaps this is the real problem at the heart of the novel. There is no easy way out. If you follow the history, the visible history, the articulated history of science fiction, there is no other path that Brissett could have taken in this novel. To do otherwise is to tell a different story altogether, a secret history, and maybe that is worse, because then women become the creatures men don’t see, and that reinforces a whole different strand of historical storytelling, one that forever relegates women to the edges of the story. Whereas, as Brissett shows, women do take centre stage, with ease, the moment a certain style of sf is put aside. And here’s another problem with this reading, with any reading for that matter. We place such a burden on the author – the actual author – to account for everything. Too much of a burden, on occasion. Here, Jennifer Marie Brissett has created this extraordinary, amazing text; this cunning survey of the ways in which science fiction is constructed, and what happens when the template is undermined, begins to disintegrate, how much better it becomes when it breaks free. And still I want more. Or something slightly different. Or I see things in the text that maybe the author didn’t, or didn’t foreground, or left for the reader to discover, like a T in magic marker on a brick. Of course I do all of this because reading is part of the process too. I could go all Barthesian and mutter about the necessity of the death of the author, but in this instance I shan’t, not least because I know that half the reason this novel is so good is because it isn’t lazy but instead is working hard to bring together so many thoughts and ideas. To complain in great detail about what isn’t there is to burden the author with the requirement to fix absolutely everything through one novel, when that’s clearly nonsensical. On the other hand, it perhaps indicates when we do this that we are – I am – hungry for novels that do more than reflexively support the status quo or else churn out the same old dystopian product while claiming that it is something new and exciting, literary even, when it plainly is nothing of the sort. Our admiration squeezes the life out of the very thing we are delighted with by wanting it to be even better, and Elysium is already awesome. And perhaps this is the critic’s biggest dilemma. How to love something without crushing it to death with the weight of expectation and analysis, when love can only be shown through expectation and analysis? This entry was posted in commentary and tagged elysium, jennifer marie brissett on August 9, 2015 by maureenkspeller.